I am so excited to be showing again this year at the Bet Am Shalom Judaica Craft Show in White Plains on November 16th and 17th. I have developed a lot of new color combinations since I showed last year. My jewelry line has expanded as well and now includes mixed media necklaces and bracelets as well as my leather wrap bracelets and knitted wire necklaces. 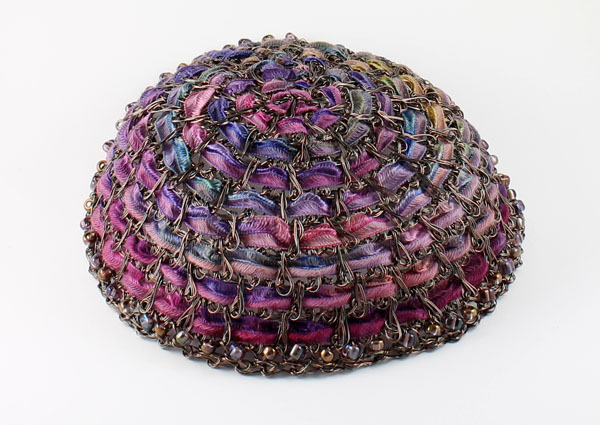 My kippot are now being worn by women Rabbis, Cantors, Bat Mitzvah age girls and many other women that are seeking a special kippah . Hope you will stop by at the show. Please also don't forget that my jewelry will be available at the Knit New Haven booth at Stitches East from Friday November 8-Sunday November 10th.